The US’s permanent representative to the UN, Nikki Haley, said she had spoken to Prime Minister Narendra Modi about the need to join sanctions against Iran. New Delhi: While the US claimed that India understood the “threats of Iran”, New Delhi has apparently started to look at alternative sources to reduce imports of Iranian oil, even as the Indian external affairs ministry asserted that there will be engagement with all stakeholders to ensure energy security. The United States’s permanent representative to the United Nations, Nikki Haley, said on Thursday that she had spoken to Prime Minister Narendra Modi about the need to join sanctions against Iran. In May, US President Donald Trump withdrew from the Joint Comprehensive Plan of Action (JCPOA), also known as the Iran nuclear deal, and announced new sanctions against Tehran, which would directly impact any firm doing business with the Iranians. “We will continue to keep the pressure up and we hope that other countries will join us. Because in our eyes, Iran is the next North Korea,” Haley said in answer to a query after a public lecture organised by the Observer Research Foundation. She described Iran as a “theocratic dictatorship”, whose “pursuit of nuclear weapons, threatens all of us”. “The Tehran regime remains the hidden, and sometimes not-so-hidden force, behind most of the conflicts in the region. And its aggressive ambitions reach much further abroad. Iran’s pursuit of nuclear weapons threatens all of us”. Haley claimed that “India also recognises the threats of Iran”. She added that the US “understands the logistics that come into play with Iran,” referring to Indian interests in developing the strategically located Iranian port of Chabahar as a gateway to Afghanistan and Central Asia. “But we have to always make sure that the priority is peace and security. And as long as priority is peace and security, the US is going to continue to try and work with our partners, friends and allies so that we are all pushing Iran to be a good accountable international neighbour,” she added. Meanwhile, news agencies reported that the petroleum ministry held a meeting on Thursday with oil refineries on Thursday to find alternatives to oil supplies from Iran. Quoting anonymous officials, PTI reports that bringing down oil imports from Iran to zero as directed by the US isn’t feasible. Iran is currently India’s third largest supplier, after Iraq and Saudi Arabia. However, an official told Reuters: “(India) has asked refiners to be prepared for any eventuality, since the situation is still evolving. There could be drastic reduction or there could be no import at all”. In Mumbai, petroleum minister Dharmendra Pradhan told reporters that for a “healthy energy mix”, India could “get oil from anywhere”. He said that the country would attend to its interests while deciding on oil imports. “The rest depends on geopolitics and those decisions will be taken based on the situations…We will go by our interests. When we decide anything on Iran, we will inform you,” he said. While obtaining alternative supplies would not be difficult, it would increase the margins as Iran currently offers the best commercial terms, according to an official quoted by PTI. Later in the day, Ministry of External Affairs spokesperson Raveesh Kumar noted that the remarks of a senior US state department official on June 27 was “not India-specific” and applies to all countries. “As far as we are concerned, we will take all steps including engagement with relevant stakeholders to ensure India’s energy security,” said Kumar. 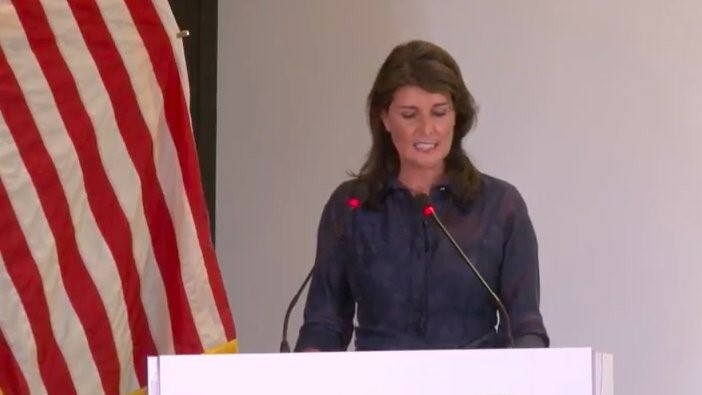 When asked about Haley claiming that India “understands” the threats from Iran, Kumar deflected the question by stating that he had not heard her remarks. He however noted that Iran is India’s “traditional partner”. “We have historical civilisation linkages with Iran. We have communicated our views on JCPOA and the the withdrawal of US. She has her own views about Iran. Our views on Iran are very clear,” he added.